Had to return this item . Sorry can not review on this item never took it out of the box. When I opened the box found quit a few imperfections. The return was very easy. Host your next party outdoors and let your guests gather around this International Caravan table. Intricate detailing gives it an elegant, high-end look, but its weather resistant construction makes it perfect for patio and backyard use. This bar-height round table sits atop curved feet, reducing the risk of tipping over and bringing your guests' drinks with it. 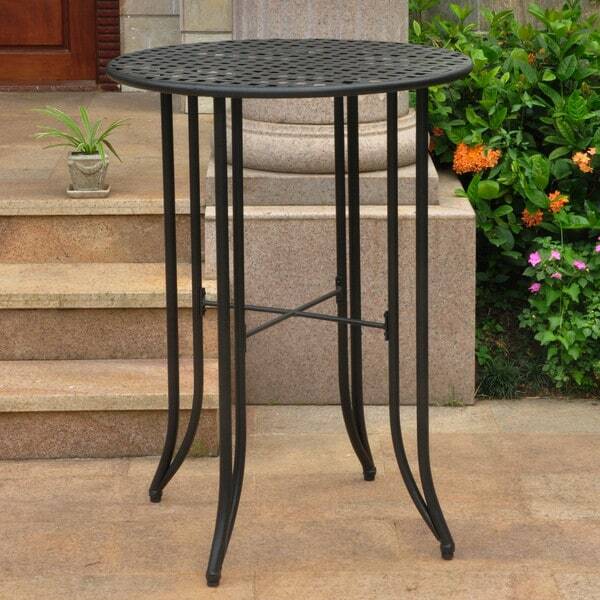 I have been looking for a long time for a bar height black wrought iron outdoor table. This table is GREAT!! It is not pure black, has a bronze affect to it, but looks great with my black wrought iron bar height chairs!! It has been outside in the rain and wind - NJ summer storms - and has weathered well!! Love this table!! When I purchased this table I was a little concerned that the quality would not be as good as what I was looking for. The reason was that the price was pretty cheap. When I received it and put it together, which was quite easy to do, I was happily surprised to find that the product quality was beyond my expectation given the low price. This table has a nice contemporary style. It is sturdy. I bought it for outdoors but we have been using it indoors. I love that it can go in and out depending on the weather and what kind of party I am having. The color is a dark brown or bronze. The tabletop is a metallic weave pattern which produces small squares. I like this much more than a glass table top which collects a lot of dust and never looks clean when sitting outdoors. I really wish that there were stools with this table. I have been looking all over for stools to match and cannot find any. I'm curious as to why they produced a table without stools to coordinate. At least there were none that came up in the search that I did. For this reason I will only give it four stars. Otherwise it's a great product. I'm still searching for stools that can be used indoors and outdoors. Bar height was perfect. Loved the detail of the table. We purchased this bar table in June for our patio. It's very sturdy with adjustable legs for leveling, important on uneven cement floors. We've had lots of use. A favorite place for outside meals and entertaining. Great table, east assembly, very sturdy, just what I was looking for!! Great table at a Great price! I ordered this outdoor bar height table for my deck and was not sure what to expect. This table exceeded all my expectations. Very easy to assemble and very well made. Great table for a great price!! I would highly recommend. Great table, we have this table over a year now and still looks beautiful. Now that we bought International Caravan St. Kitts 9-foot Crank-tilt Wall Hugger Half Patio Umbrella, we can enjoy meals outside on this table more often. The table is a perfect small bar height table for around our pool. This is a great table! 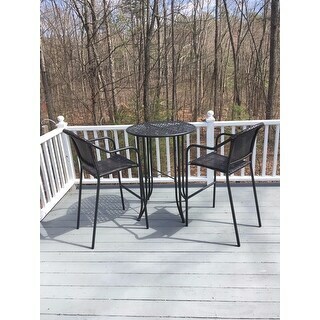 Easy to move around; very sturdy & perfect as an extra table by the outside bar/patio area. It is also very easy to store. Goes well with my other outdoor furniture. The color is like a matte black. Very satisfied. Sturdy, easy to assemble, nice finish, but I recommend covering with a waterproof sealer or cloth. 2wks outside and Ivan already see rust spots on the top surface. This is my 2nd table like this. The first one lasted about 7 years outside before the top completely rusted away..I think I will spray this one with a water protection coating. It's a great looking table. Ordered for my pool area and was pleased with the quality and the price. Very sturdy and easy to assemble. Great looking pub table! I had 4 chairs that blended in for a nice looking set on the patio,,,sturdy and comfortable. I would recommend this table but it will rust in the weather. WE USE THIS HIGH TOP TABLE ON OUR BACK PATIO WITH FOUR STOOLS AND AN UMBRELLA. VERY COMFORTABLE AND WELL MADE. WE EVEN HAVE ROOM TO ADD AN ADDITIONAL STOOL IF NEEDED. Tables were of high quality, very sturdy and looked good. Only knock is unsmooth surface which can cause top heavy drinks to fall over. Would recommend to anyone. These tables I ordered can in rather quickly. They look nice and had to do some assembly, which was pretty easy. Color was a little off from what I expected so my current stools don’t match. That is an easy fix with a can of spray paint. The quality of weight was less than expected. That is why I gave 4 stars. Love it. Just the perfect size. Open weave top prevents rain puddles. Definitely recommend if you only need a small top. Using on a deck with high chairs. Table is VERY study and weather resistant... (looks like new and purchased over 5 years ago!) It is fairly heavy, however that's why it continues to look like new!!!! Perfect to go with existing stools we had. Heavy enough to stay put. Nice looking finish. "How do you store this in the winter? Bring inside? Leave outside covered/uncovered?" "Is the top of this table solid? Or is it a mesh or a weave? Is it large enough for two dinner plates plus glasses? Thx!" This table measures approximately 30 inches in diameter and has a woven iron top. "What is the height from the floor to the bottom of the top of the table. I have bar stools eith arms that are 39" tall"
I measure 39-1/8". If for some reason, that is off by a fraction, you can always put plastic stick-on pads onto the legs to raise it about 1/4". It should work...by a hair! "I cannot find the circumference of this table in the details. We have a small balcony space for which I am considering purchasing this table." Hello Cathy L, this table is approximately 40" inches high x 30" inches wide x 30" inches deep. Please let us know if you have additional questions. Thanks for shopping with us. I have tall stools and it's hard to find just a table to go with them. I would have preferred a larger diameter table at bar height but couldn't find one. "what is the height of table; floor to top of table." Hello Jolenana, this table will be approximately 40 inches tall. I hope this helps. Thank you for shopping with us! T.B. thisi s big enough for two plates and glasses , but it is also mesh with a basket weave with about 1/4 inch gaps. "For the table, what is the distance between the legs and then also the feet? Thank you." Hello kssaz, the width of the legs is approximately 27 inches, and the width of the feet is 30 inches. Thank you for shopping with us!